Acker Wheel, in San Jose, is the place to buy factory wheels, factory rims, used wheels, used rims, factory original wheels, alloy wheels, rally wheels, and stock wheels. Order Ford wheels, Toyota wheels, Honda wheels, and Cadillac wheels! Look up your rim or wheel for any make and model in the Acker Wheel Catalog or Inventory and order today! Buy a wheel or wheels at Acker Wheel! Acker Wheel offers a large inventory of factory wheels, factory rims, used wheels, used rims, factory original wheels, alloy wheels, rally wheels, new wheels, and stock wheels, for you car or truck. Look up your make and model in the Acker Wheel Inventory or Acker Wheel Catalog. Locate the wheel number you want to buy and call Acker Wheel to place your order. One make and model of a car or truck may have twenty, twenty two, twenty four, twenty five, twenty six, available wheels. Look up your make and model in the Acker Wheel Inventory or Acker Wheel Catalog, Find your wheel number and Call 1-800-383-7974 to place your order today! AT OUR SITE WWW.STOCKWHEELS.COM ! Browse Acker Wheel Inventory! Or, look over the Acker Wheel Catalog! Find your wheel number and Call 1-800-383-7974 to place your order today!. Most orders received before noon are shipped via UPS the same day. Additionally, ACKER WHEEL offers an average saving of 30% to 80% off dealer list prices (i.e., Mitchell, Hollander, etc.). and stock wheels for you car! 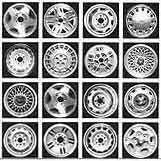 FOR ALL... ACURA wheels, AUDI wheels, BUICK wheels, BMW wheels, CADILLAC wheels, CHEVROLET wheels, CHRYSLER wheels, DATSUN wheels, DODGE wheels, FORD wheels, GENERAL MOTORS wheels, HONDA wheels, HYUNDAI wheels, INFINITI wheels, ISUZU wheels, JAGUAR wheels, JEEP wheels, LEXUS wheels, MAZDA wheels, MERCEDES wheels, MITSUBISHI wheels, MUSTANG wheels, NISSAN wheels, OLDSMOBILE wheels, PONTIAC wheels, PLYMOUTH wheels, PORSCHE wheels, SUBARU wheels, TOYOTA wheels, VOLKSWAGON wheels, VOLVO wheels, and many more! ALL WHEELS ARE INSPECTED, NO BENT WHEELS ARE SOLD! INSTALLING custom wheels on your car? Sell your factory original wheels to Acker Wheel!